Houghton hall, a beautiful Palladian house on the North Norfolk coast, already has an impressive art collection, with works by Richard Long, Jeppe Hein and Rachel Whiteread. 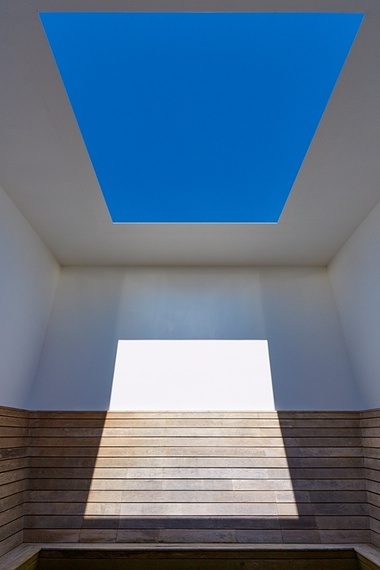 There is a previously commissioned piece by Turrell, called Skyspace, from 2000 (image above). This current exhibition includes the illumination of the Hall’s facade into a light show, which begins at dusk on Friday and Saturday evenings. LightScape, James Turrell at Houghton Hall, North Norfolk until 24th October 2015. This entry was posted in bits + pieces. and tagged art, Houghton Hall, installation, James Turrell, Jeppe Hein, Rachel Whiteread, Richard Long on July 24, 2015 by owls house london..